samyak classes started since 2013. 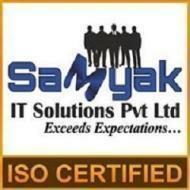 Samyak IT Solutions Pvt Ltd are known leaders and established as IT Development and Training Company in Jaipur India. A strong desire to establish himself as an entrepreneur and provide much needed skills to industry led to the idea of starting Samyak IT Solutions. "Worst experience ever. Cheaters they are. First they took 21000 saying the course is 2 months and after taking 10000 they demanded for remaining very next day saying the course is of hardly 1 month. Did not refund the actual amount of money. I have complained and have taken legal action against them. Have all the recording and conversations. They lost my application form too where they had committed 2 months regular classes. Administration is fraud. Teacher was good though. Even he didn't know that they were charging so much fees for it. Fraud classes. Only cheaters and liers are there. " Samyak Classes conducts classes in .Net Training, C Language and C Sharp. It is located in Vaishali Nagar Jaipur, Jaipur. It takes Regular Classes- at the Institute and Online Classes- via online medium. It has got 1 reviews till now with 100% positive feedback.